Boaters have a special need to know about the weather and tide conditions. High winds, lightning, rough seas, poor visibility and strong currents can potentially turn an outing into a disaster. Knowing when high and low tide will occur is especially important for boats entering and exiting river entrances and crossing bars. The combination of an outgoing tidal flow or low tide can cause waves to become steeper than usual, making your boat difficult to navigate. Don't run the risk of running aground! Make sure you have the latest tide tables aboard so you can check the tidal conditions for the area you plan to be boating in. Know when to go. When in doubt don't go! Recognise that weather is constantly changing, and that forecasts may not always be accurate. Watch, listen and read weather reports before departing. In port, wait for it to pass. Close to shore, return immediately. If at sea, "Hove to". (to slow engines, reduce sail, maintain steerage with the bow facing into the wind or sea) You may also deploy a sea anchor. On the water, give your vessel plenty of room, head out to sea away from shorelines and harbour entrances, batten-down, secure hatches, stow, reef sails, don PFD's and stay in touch with coastal radio stations. 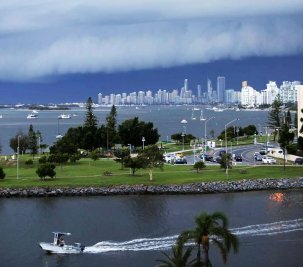 The Australian Bureau of Meteorology provides an extensive knowledge-base of weather information on its website as well as a variety of ways to access the information depending on the equipment you have onboard you vessel. Even if you are planning a short day trip, studying the weather forecast and tidal conditions should precede your departure. Even if you are planning a short day trip, studying the weather forecast and tidal conditions should precede your departure.